Streaming TV could be an app you need to download and install on your smartphone. It could be software for a PC or Mac computer. At the same time, a streaming TV could be a cable you have to subscribe to. It could also be a digital TV that you need internet access to enjoy or to install a tool to make it really awesome and have the taste of a device you want. In one way or the other, we all have access to a streaming TV online or using the web or on our media players. We take a look at some app to stream movies [TV] on Android phone and iOS devices in this guide. The internet is a vast society with a lot of things to enjoy with or without you needing to empty your account to have access to it. Most streaming TV apps are even free while some streaming devices can cost a fortune. Should you find it difficult to get your hand on the best streaming TV app for your smartphone, this article will end your worries and provides you will all the best app you can use to stream movies online on your smartphone. Some of the streaming apps have a computer version while some do not. However, to use those streaming app without computer software on your PC or Mac, download and install smartphone emulator to run smartphone apps on your PC. That is a smart way to use Android and iOS apps on your computer you know… So, wise up and don’t depend on your mobile alone for entertainment. What is a Streaming TV App? A streaming TV is digital distribution of programs that are meant to be seen or watch on a TV set over the internet whether via an app or via an online website such as Hulu, Netflix, YouTube, etc. While most of the online website to watch series, TV shows, episodes, documentaries, and the rest of them have a TV app to watch and download contents directly on mobile using their mobile app. Streaming TV comes as a replacement to the analog world where you have to get to your TV set before you can watch movies or films of your choice. With the streaming app being developed, the analog world has started to fade away since most people now have a smartphone to watch live programs and enjoy more of what they pay for on TV cable using an app. Apart from the use of apps on your mobile to stream TV shows, TV programs, watch movies online, there are some streaming devices that can be connected to the internet for streaming movies online at home and at your place of work. Any of these streaming devices is a better replacement for the analog TV you have at home. Our first choice of the streaming device here is the Android TV which is a TV set running an Android OS. 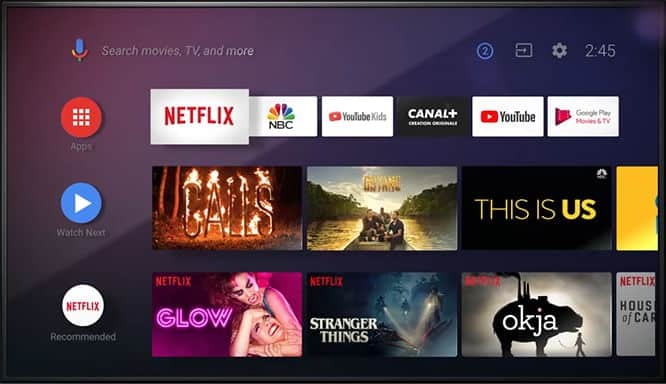 This is different from other TVs, but, the TV is a Smart TV that simply supports the use of apps that are available for an Android phone on the TV set. At this time, Android TV is one of the most sort TV that can simply run a mobile app with the use of the mobile add-on. In this regard, to start using Android TV as a streaming TV, you have to download your favorite streaming app and install it on it. The 2018 smart TV has had the 2nd generation since its birth and both generations are good to go using a mobile app on it to streaming movies online for free. Roku is a popular streaming device to streaming all sort of shows, movies, thrillers, episodes, documentary and support entirely all video platforms. Not only can you use the Roku device as a streaming TV you can as well use the popular media player as connected to your PC using an HDMI cable to connect your laptop or desktop or Mac to it. The only noticeable downside of the Roku streaming device is that it doesn’t support the use of iTunes as oppose to using Android add-ons on it. This tool is a giant in the industry when talking about a streaming service that supports to be used as a streaming TV. If you have hanging around for a while, both Amazon firestick and Roku are a few in the top 10 streaming service for home and office use. The limitation of the streaming device is a bit complex when compared to the Roku streaming device, the Amazon Fire TV stick doesn’t literally support YouTube and iTunes. However, other streaming TV apps or software or services are welcome on the device. So, if you are planning to build your movie enthusiasts and take it far from the web, this is a streaming service you can down to pay for. You can install a streaming TV app like Showbox, Terrarium TV alternatives, and the rest of them depending on your choice. For those that don’t consider the cost price of getting an Apple device or gadget, here is a TV especially for you to be used as your must-have an online streaming service. This device isn’t far from the previously mentioned streaming devices, Roku and Amazon Fire TV, however, the Apple TV support a fast and a beautiful 4K for the best experience you can ever imagine. Apart from the Siri control feature, you can also bring to the device whatever you think the device is missing in your case. Like the streaming app, you can get the Showbox iOS and install it or mirror it with the device. Apart from the Amazon prime, you can use virtually other non-Apple service or app on the device and have a reward for your spending. This is probably one of the streaming devices you have been waiting for. Yes, it is somehow better than the Google Chromecast, the Apple TV, the Amazon Fire TV, and even Roku. However, lack of excessive popularity doesn’t make it known to the majority of Apple users that another streaming TV for the streaming in the 21st century is the Nvidia’s Shield TV. Apart from installing your device streaming TV app on this gadgets, it’s also best for the gamers with the support of the HDR 4K feature, it makes the streaming device best and fit for every folk that loves to play games in a large, fast, and with a beautiful resolution. Note: Some people love the Chromecast, but, I don’t think it functions as the above-mentioned streaming devices. Since you have to control it from your Android or tablet which you may not love. However, if you love everything to just keep happening right on your smartphone, then, the Chromecast is your choice of device. Do not forget that the Chromecast app is a must-have on it to be able to enjoy using it with the Android home and the even the Android TV we mentioned earlier. Android and iOS devices are the most competitive followed by the Windows OS and then, others follow. This means that reading this guide, you can either be reading with your iPhone or your Android phone. In this regard, here, we compiled the best streaming TV app for Android that can be used on iOS devices as well. Showbox is a popular TV app to watch and download movies on Android and iOS devices without rooting or jailbreaking. It’s one of the best apps to watch movies on Android for free. There is no need to register to use the app. Neither do you need to jailbreak iPhone to download and install Showbox! The user-friendly TV app has a friendly UI that makes it very easy to use and navigate between the app to search and download movies online to your smartphone. The Showbox APK app can be downloaded and install on Android. While iOS users can download Showbox iOS using Cydia Impactor with the help of a PC or a Mac computer. If you are a novice that won’t want to spend much on streaming TV on your smartphone with the help of the app, Showbox is recommended. However, Showbox is considered illegal in some region, so, it’s advisable to use a VPN when you are streaming movies online using the Showbox app. Showbox isn’t a torrent app so it’s far from it. But, since the app share contents, it doesn’t have the total right to share, it is considered illegal. With the interest of thousands of people in mind, MovieBox came as a relief to people to be able to watch movies online for free and without paying a dime, not even registration is needed to start to stream TV shows, episodes, animations, documentaries, anime programs, and many more on MovieBox. MovieBox TV app is very popular when it comes to watching movies, TV shows, episodes, season films, Hollywood and Bollywood, and other local movies on your smartphone. To use Showbox on all your device, download Showbox APK for Android and MovieBox iOS for iPhone, iPad, and iPod to turn your smartphone into an online TV streaming device. When you are local for a TV series app to quickly replace the traditional old ways to watch movies going to the Cinema or buying a disc for your choice of movies, the MovieBox come as a fast replacement to bring streaming access to all devices for free. The app has unrelenting numbers of features which include a free download and free access for life. This is another popular app to consider when scouting for the best app digital app to stream TV on all smartphone and on a Smart TV such as Samsung, LG, Hisense, and many others. CinemaHD is known for sharing only movies that are in HD to maintain a certain level of prestige that all contents available on the platform are only in HD format. The list of movies and TV shows that can be downloaded and streaming within the app isn’t limited to a single section. With the app, you can watch your favorite movies thriller on-release, old and new movies are available to watch and download, users are also allowed to favorite movies for later see or download. When you favorite movies using this app you can go ahead to it straight when you want to download it later. However, the CinemaHD streaming app has some unique features which are similar to other streaming apps out there, this includes free access to unlimited numbers of movies, free for life, no registration, no one-time payment or related payment itch to start to use the TV app. Popcorn time is different from Popcorn flix. Although, they may have similar contents and purpose of operating. But, they are different. However, when you are searching for the best app to stream TV on PC, Mac, Windows Phone, Android, and iOS devices for free, and on all the streaming devices shared above, Popcorn time is yet another app to put into consideration. Popcorn time is a standalone website to stream movies online using visiting the website on your device browser. It also has an app to bring the entire movies, TV shows, thrillers, episodes, Hollywood and Bollywood movies, new release, upcoming, and many more to you on your device. With the Popcorn time TV app, you only need an internet connection to enjoy a bountiful of it at your own leisure time. While the app works on devices like Android, iOS, and PC, to use Popcorn time on Smart TV such as LG, Samsung, etc, you are advised to use the smartphone mirror feature and mirror the screen of your phone to your TV. The Popcorn time streaming TV is one of its kind when it coming to a constant database update for new movies and movies on request. OneBox HD is another well-known app to watch and download movies on Smartphones and on computers. With the OneBox HD, you will have unlimited access to various movies from different categories for free. The OneBox HD app for streaming TV provides direct access to various movies from various sources like Netflix, ShowTime Anytime, and many others. The OneBox HD is a popular TV app used by thousands with a daily increase in the number of users. If you are searching for a single app that function as a TV series app as well as a TV show and movies download the app, OneBox HD is highly recommended. Tubi TV is another popular app for streaming live TV on your Smartphone, computer, and on the web for free. The simple interface of the Tubi TV app makes a popular one couple with the easy to navigate feature. For that fact that Tube.tv came to be the 6th best streaming TV app for Android and iOS device, it’s one of the best you can choose to download and enjoy unlimited access to millions of free and paid movies on the go. The app has a simple UI and easy navigation which makes it easy to use for a novice. You don’t even have to be a professional to search and download movies for free using the Tubi.tv as your favorite streaming app on your device.